« Government attacked? About time too! I was extremely troubled by reports this week that the amount of insulin being prescribed has increased 3-fold in just 20 years. The BBC reported that this is due to the huge increase in people with Type 2 diabetes now using the drug. They correctly allude to the fact that this indicates a failure in diabetes care! There should be no need whatsoever for the vast majority of Type 2 patients to find themselves using insulin if they are given proper nutrition and lifestyle advice. If you experience any of the following symptoms, call your doctor immediately: these are the more serious side effects! 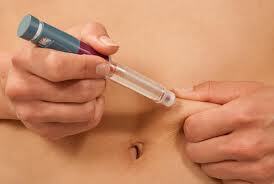 Many diabetics may be lead to believe they can eat whatever they like and compensate by injecting insulin. But the health risks associated are not insignificant! Balancing blood sugar using food is a very different experience compared with using insulin. People who do report easy weight loss; lower blood sugars on average and over time this clearly shows in HbA1c readings; more energy, vitality and big improvements in overall wellbeing. Try it – you might like it! Just like the Type 1 client who reported back just last night that with a few simple dietary changes he has halved his fast-acting insulin in just 2 weeks, lost 6lbs in belly fat and is feeling very well indeed thank you. Am so happy for him, and can’t wait to see what he achieves by the end of his Rebalance programme! This entry was written by rebalancediabetes, posted on February 12, 2014 at 11:13 am, filed under diabetes, Education, fat, healthy eating, RebalanceDiabetes, sugar, weight loss. Bookmark the permalink. Follow any comments here with the RSS feed for this post. Post a comment or leave a trackback: Trackback URL.